Those in immanent proximity to little ones for extended hours always appreciate a good nights sleep. Mr. Possum loves to sleep too. He sleeps all day, and then he likes to travel down the newly finished 8 lane possum super highway. He likes to do this at the hour that is technically referred to as " the dead of night." 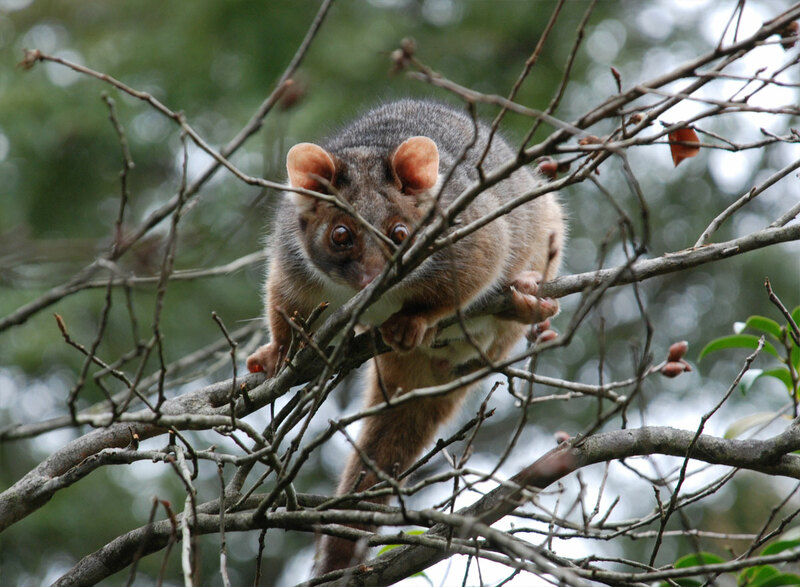 The first stage is on the aforementioned possum superhighway's on-ramp - a young freshly surfaced branch that reaches the roof. He is as noiseless as a ninja on that. This gives Mr. Possum the element of surprise. Stage Two comprises of the sound of Mr. Possum's little scratchy feet scuttling over the roof. Stage Two is an underrated yet important process preceding Stage Three. It is what is called "the setup" - the little scratchy feet take the professional sleeper out of REM - dead to the world sleep, into post hypnotic dozing, and thus suggestible to any prompting. If it wasn't for the scratchings and scuttlings of Stage Two, then Stage Three could not occur. Then comes "The Leap of Faith." There are people around here that argue "the leap" is a stage in itself. Purists like myself see it only as a transitional jump - a daring and huge one at that, but a jump all the same. Stage Three is the precise moment the jump finishes. It is the shortest stage as our acrobatic aeronautical pre-flight possum lands with a resounding crash on a tin roof. The empty shed amplifies the sound, and (as the little ones have thoughtfully left the shed door open after playing in there) the amplified noise travels straight back towards me in Stage Two affected sleep where I wake up yelling in fright. The little ones, however, sleep peacefully through all of this. They wake up fresh and happy on a brand new day, all ready to play in the shed again. I appreciate a good night's sleep, for sure. Fortunately my sleep has never yet been interrupted by a Mr. Possum. I'm a bit concerned though, because we recently had our shed re-roofed and it now has a tin roof. It is also now a play area for my little(ish) ones. And it has a door which can be left open. I shall keep a sharp look out for any Mr. Possums. I don't like waking up yelling in fright. Sounds like you have entered risky territory concerning your sleep. It may not be Mr. Possum. It may be other nocturnal noise-makers.